Welcome to the Circus with our new Ringleader Mini Backpack! 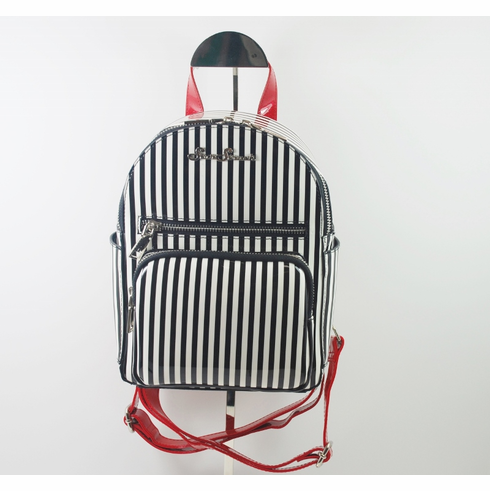 Made from Black and White Stripe and Ruby Red Sparkle vinyl it is sure to get noticed! This bag is the perfect compliment to any outfit! This handbag features a roomy interior lined in sturdy Black cotton, front pop-out pocket, top zipper closure, dual adjustable straps, and a top handle so you can grab it and go! Removable adjustable straps allow this to be worn as a backpack or remove and adjust one strap to wear over the shoulder or cross body. Inside you will find a slide, cell phone, and a zipper pocket. Measures 10 inches tall, 7.5 inches long, and 3.5 inches wide.